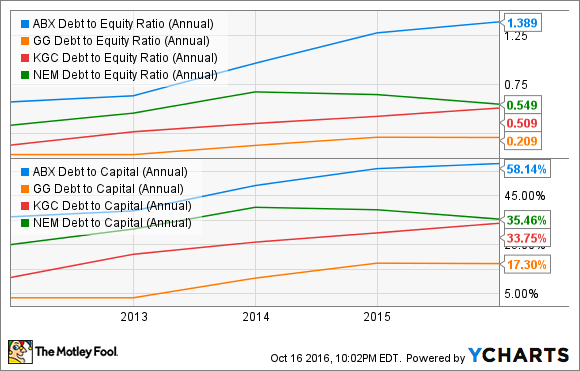 Digging Into Gold Stocks: Do Goldcorp's Strengths Give It an Edge? They may not be competitive advantages, but these strengths could be as good as gold. With the price of gold up nearly 20% year to date, investors are turning their attention to gold-mining stocks. So let's follow suit and turn our attention to a global leader in the gold industry, Goldcorp (NYSE:GG), to see where its strengths lie, and whether they give the company an edge over its competition. Though it's not necessarily a competitive advantage today, one of Goldcorp's self-proclaimed strengths is that its "asset portfolio is located in politically stable, low-risk jurisdictions in the Americas." Despite Goldcorp's claim that its assets are in mostly stable regions, this doesn't mean the company doesn't face challenges from time to time. For example, last month, when the company encountered an illegal blockade by a trucking contractor at its Penasquito mine in Mexico. Though operations were suspended for about one and a half weeks, management doesn't believe it will have a material impact on overall production. As inconvenient as this incident may have been for Goldcorp, it certainly doesn't equate to tumultuous relations with the Mexican government. The security of operating in a stable political environment is not a luxury that every gold miner enjoys. Kinross Gold (NYSE:KGC), for example, estimates that 25% of its gold production for 2016 will come from its two mines in Russia. And Newmont Mining (NYSE:NEM), one of the largest gold miners in the world, had such a turbulent relationship with the Indonesian government that it led, in part, to the company's decision to sell its interest in the Batu Hijau mine. In a capital-intensive business like mining, which is subject to the whimsical nature of the price of gold, companies must be able to deftly manage their balance sheets. Herein lies one of Goldcorp's strengths. In comparing Goldcorp to its peers, it's easy to see how conservative management is about taking on debt. Barrick Gold (NYSE:GOLD), a leader in the gold industry, is clearly more willing to take on considerably more risk to finance its operations. Kinross Gold and Newmont, by comparison, appear significantly more conservative. But, more conservative still, we find that Goldcorp's debt-to-equity ratio lies under 0.21, while its debt-to-capital ratio equals 17.3. Management reinforced its conservative approach to debt and its long-term commitment to Goldcorp's financial health on its second-quarter conference call. According to David Garofalo, Goldcorp's president and CEO, the company is targeting a net debt to EBITDA ratio below 1.0 by 2018. With such a strong balance sheet, Goldcorp should have no trouble retaining its investment-grade rating from Standard & Poor's Ratings Services, Moody's, and Fitch Ratings. One of the company's self-proclaimed competitive advantages is its "suite of exciting brownfield growth projects." This seems a bit of a stretch, but that's not to say that the projects aren't one of the company's strengths. With opportunities at its Penasquito, Musselwhite, Red Lake, and Porcupine sites, Goldcorp believes that successful execution of these expansion projects could "provide the potential for low-capital-intensity, low-risk, and high-rate-of-return growth over the next five years." Image source: Goldcorp corporate presentation. Management estimates that both the Penasquito Pyrite Leach Project and Musselwhite Materials Handling Project will begin commercial production in the first quarter of 2019. The pipeline, in and of itself, means little; however, if the company proves successful at executing the projects at Penasquito and Musselwhite, it would certainly indicate that the pipeline is an asset which could prove valuable for the company for many years to come. Although it doesn't retain competitive advantages that greatly distinguish it from other gold-mining companies, Goldcorp does have some strengths that suggest that the company is quite capable of future success. Besides a strong portfolio of mines and projects, Goldcorp's solid balance sheet is worth its weight in gold. It may not be the first company to come to mind when discussions of gold-mining companies arise, but mining the industry for quality companies transcends popularity contests.